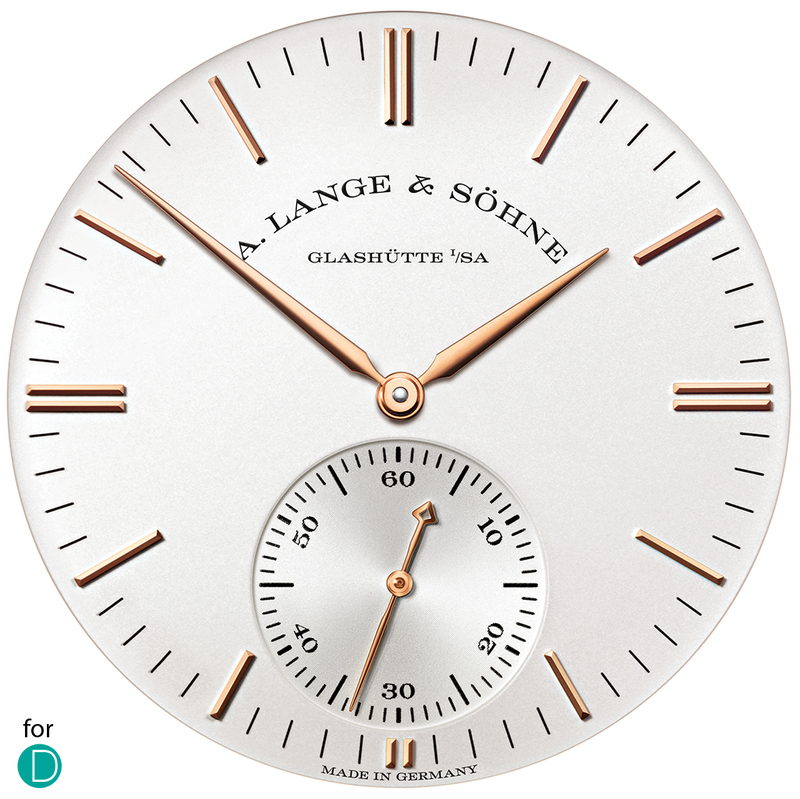 The Lange Saxonia was one of the four original watches introduced a bewildered watchmaking world in 1994. The other 3 being the now iconic Lange 1, the visually arresting Arkade and the technical showcase Pour le Mérite Tourbillon. 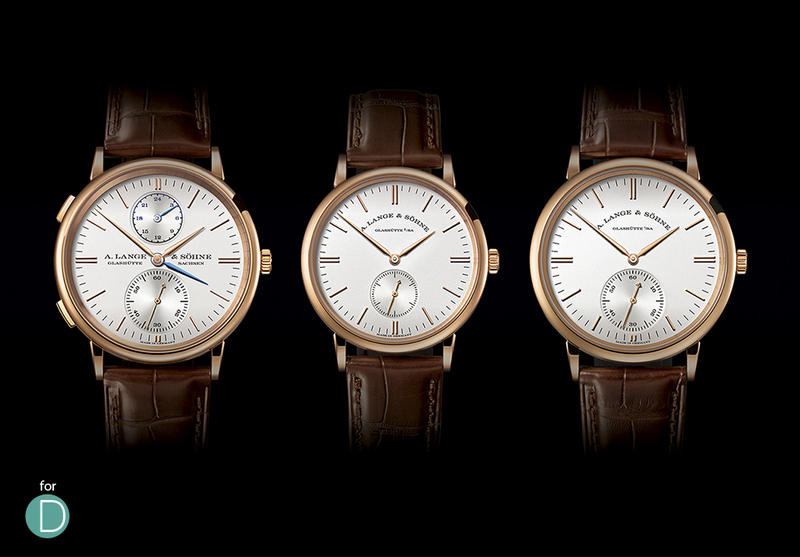 The three new Lange Saxonia from left to right: The Saxonia Dual Time, The Saxonia and The Saxonia Automatic. Three new models have been announced in this pre-release: the Saxonia, the Saxonia Automatic and the Saxonia Dual Time. The dial layout of the new Saxonia Automatic. The Saxonia family as it has now come to be known is based on a specific dial layout. A very simple and classical layout, using applique bar markers for the hours and line minute markers. This layout has stood the test of time, but for 2015, the new Saxonia series feature a re-designed dial. The redesign intent is to improve the legibility. Small changes have been made. The gold appliques have been moved slightly to the periphery. Double batons are now used for the markers at 12, 3, 6 and 9. And the minute markers extended slightly. In addition, for the Saxonia Automatic and Saxonia Dual Time, ten seconds markers have been added. The magnificent L086.2 remains unchanged on the new Saxonia Dual Time. This photograph shows the caliber on the original Saxonia Dual Time announced in 2011. The movement remains unchanged, but the case size revised from 40mm to 38.5mm. The size of the case has also been reduced. The Saxonia is now 35mm and the Saxonia Automatic from 37mm and Saxonia Dual Time from 40mm to 38.5mm. The Saxonia still carries the time tested L941.1 and the Automatic now with the L086.1 and the Dual Time L086.2. NB: The nomenclature for reading the Lange caliber number is as follows. The first two digits denote the year in which work started on the movement. The third digit is the specific to each caliber which began development in the same year. The number after the decimal point denotes the version of the same caliber. For example the Saxonia is L941.1, this means development started in 1994, and this was the first movement for that year. 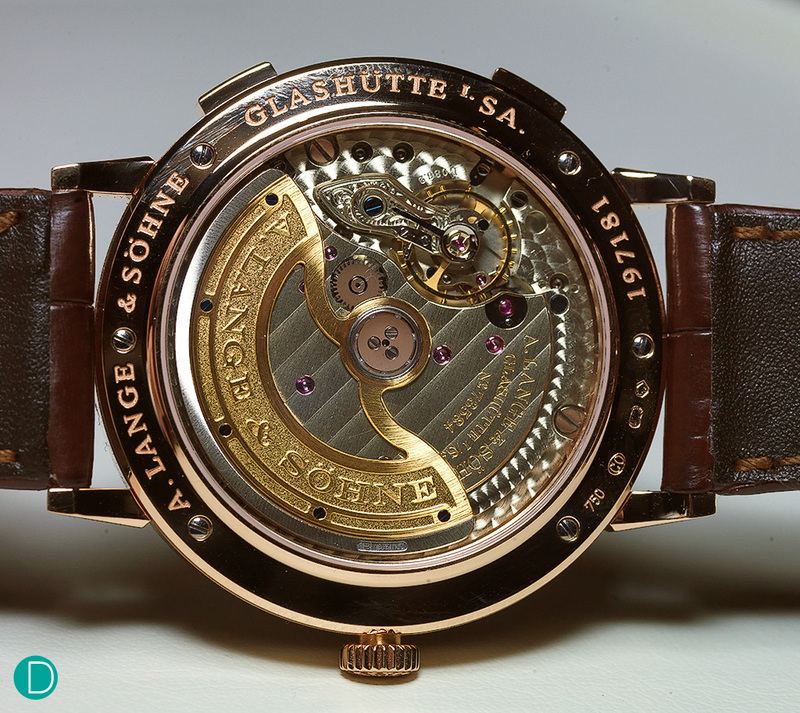 L942 is the movement for the original Lange 1815, is the second caliber to begin development in 1994. As also can be seen, the Saxonia Automatic and the Saxonia Dual Time is based on the same caliber L086, which started development in 2008, the sixth movement for that year, and but are two different versions on the same base.